The Vdara Hotel is a non-gaming, architectural gem, that has, among its many attributes, a giant Frank Stella painting hanging behind the registration desk, fabulous public art hanging all around it, and a great chef hanging out in its one and only restaurant. That chef is the German-born Martin Heierling — he of Sensi in the Bellagio fame — and what he’s doing at Silk Road is both an extension of his all-over-the-map style, and a refinement of it. As a three meal a day restaurant, Silk Road must be, by definition, all things to all people. Heierling takes that concept a few countries further with a menu that does tasty renditions of everything from lamb meatballs that would please any Mediterranean mother, to a avant-garde, very Spanish, way with boquerones — in this case, white anchovies rolled around feta, dill and mint filling sitting atop a highly piquant piquillo pepper sauce. While only a $12 appetizer, it might be the best thing on a menu full of tasty delights. At Sensi, Heierling is known for everything from tasty steaks to decent tandoori. Here, he keeps things more Mediterranean with Kataifi (shredded phyllo) crusted shrimp that, while a bit overwrought for our tastes, put you in mind of upscale Turkish street food and tagine steamed mussels that are French by way of Algiers. Of course, this being a worldly restaurant being done by a fusion food fanatic, he would be remiss in his geographical passions if he didn’t give a nod to Thailand with fabulous cilantro, galangal tapioca and Kaffir lime scented chicken and coconut soup. About the only mezze we haven’t been crazy about is the not very charred, unapparently marinated beef carpaccio, that was so salty it would’ve sunk in the Dead Sea. We haven’t gotten around to trying such compelling entrees as crispy Thai red snapper with green olive butter, or seared John Dory with ras el hanout (mixed Moroccan spices), but the airy and artful (literally) dining room makes a visit here so attractive (as does the easy in and out off Harmon Ave.), that’s it’s only a matter of time. In the meantime, and while we’re eating our way through all the Aria eateries, we’ll content ourselves with memories of Heierling’s top flight mini-burgers, and just about the best, tempura-coated, deep fried oysters around. Two other notes: Silk Road makes just about the best use of natural light of any restaurant in the history of Las Vegas, and the coffee (Illy French press), is nonpareil. Good King Wenceslas Had It Right – Merry Christmas To All And To All A Good Night! ELV, inside sources at Wynn, have David Walzog taking over the DB space. word is they will create a Pub/Tavern style spot. 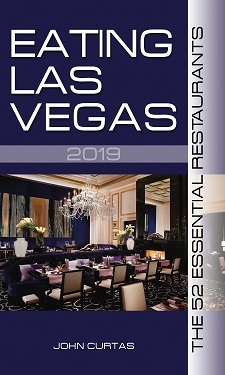 the gastropub craze finally going to hit vegas???? I have been there twice for breakfast and have enjoyed delicious blueberry and ricotta pancakes with orange blossom syrup that was heavenly! Another visit, I had the crispy french toast with spiced cider reduction which was a fun and unique interpretation of this breakfast favorite. I can’t wait to go there for dinner! Yeah, it’s bound to happen! With even Orange County and Salt Lake City ahead of us on the “gastropub curve”, we need to do some catching up. I can hardly wait to try Silk Road for breakfast! My dinner had its flaws, but overall I think it was a lovely experience. The bintje gnocchi is a great vegetarian dish, even if the portion is on the small side. Finally! City Center pictures!!! Thanks from those of us who haven’t recently traversed the City of Light. Was that cotton candy topping one of the desserts? Space-age dishes at Silk. ok, so i broke down and tried Silk Road for lunch yesterday (only because there really isnt much open for lunch in city center). and as expected it was terrible!!!!! so in a place with only 4 tables sat our table of 4, took almost 2 hours to eat a lunch. not because we were taking our time and kicking back, but because we had to wqit 20 minutes between courses for food!!! the lunch menu is pretty lame, limited choices. we tried the beet salad, tuna tartare bites, tomato soup to start, salad was so small and flavorless, the tuna was really nice both in appearance and flavor. the soup was decent enough. entrees were the kobe hangar steak- over cooked and tough, hamburger-dry meat and not tht great, but ok, truffle gnocchi-which were terrible, they were mushy and the truffle was totally over powered by the gruyere and comte cheeses, and finally the mussels-the broth had no flavor, was colored with safron but did not taste of it, and really didnt have many mussel for an entree portion, was actually smaller then what a app portion should be. presentations were nice over all, but it was not good. would not recommend and will not be back. service was attentative (better be with 4 tables) but why serve bottled iced tea, what happened to fresh brewed???? even though its republic tea, which is good, but i can see the chef didnt want to carry too many items, since i assume they are running room service to the tower from there as well, as the ketchup and may came out in p/c bottles used in room service!! if your thinking about silk road, skip it!!! Hi, whenever I browse posts I just find myself seeing a small part of the site’s post. I do not understand if it is caused by my web browser(Safari) or not, anybody else annoyed by this thing?